Following free breakfast at the Hotel U Suteru - something fairly standard when travelling in Europe - we were ready to begin. For our first day in each city we asked David Manley at Go Real Europe to book a guide to give us the lay-out and history of the city. I assumed we would be in a group, so imagine my surprise to realize everything we booked with him was one-on-one. This meant the guide can cater to our interests as the tour progresses. We were absolutely thrilled with Maria (hope I have the name right) who met us in Prague. For 3 hours this extremely knowledgeable guide walked us along the Royal Coronation Route through first Old Town, then across the Charles Bridge to the Lesser Town (also called Little Quarter), and finally ending up at the very old Prague Castle featuring the stunning St. Vitus Cathedral. Everything was covered - saints, religion, myths, the significance of certain architecture, why John Lennon has a memorial wall here and the fact the Cathedral was built over 1000 years. She also showed us how to use our first transit tickets. The only downside was I had to snap pics quickly as we were walking as neither Maria or Glen slowed down for me, so many were not beautifully framed - several listing to the right it appears. Left is a Czech building in cubist style only seen here. Right is just one of the cobbled streets and sidewalks we walked. I loved the fact she took us into a small market right at the start and showed us 2 very standard Czech foods - intricately decorated open face sandwiches and a round pastry with several different fillings. Then it was on to the tour. 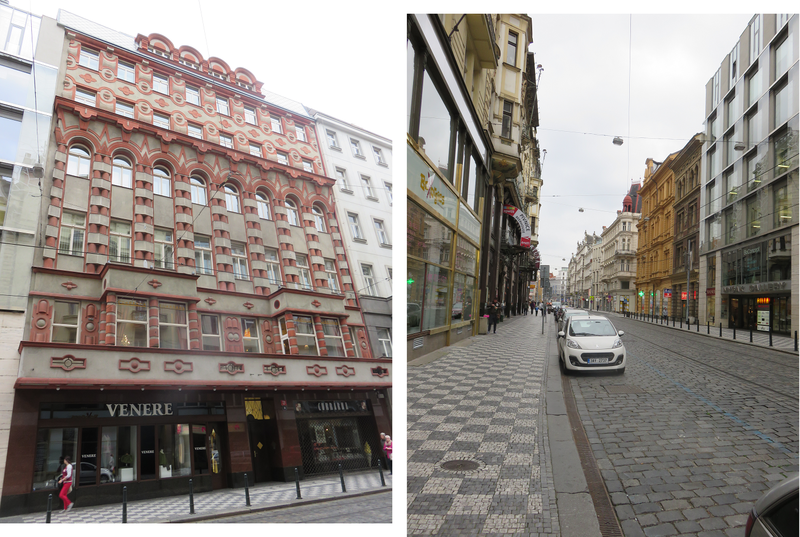 Here is your first tip for wandering Prague - WEAR GOOD WALKING SHOES. They should tie on or Velcro tight. Many of the sidewalks and streets in old town were cobblestone with large spaces between, uneven and with occasionally missing pieces, so wearing a heel or loose sandal would be sure to earn you a twisted ankle. The architecture varied widely from very old (our hotel in "new town" was built in the 1400's) to more modern offerings such as a building built during the era of Cubism that was created in a style only seen in the Czech Republic. As we moved through Old Town, the streets became narrower and more winding. Small churches were tucked in back corners and you really felt you stepped back in time. Lots of small shops, hotels and restaurants were scattered throughout. The most tourist laden place in Old town was Old Town Square - a large open area surrounded by a hotels, restaurants and the Old Town City Hall where you can see the medieval Astronomical Clock. Once an hour it has a little show which I always just missed. Everyone stops to see it, but most admit it wasn't that big a deal. I have no idea, but it certainly was the scene of drinking and partying every night. From there we walked across the Charles Bridge, stopping here and there to talk about statues and their significance. Saint John of Nepomuk was thrown off this bridge and has a statue with 2 plaques honouring his memory. Legend has it that to touch one of the plaques will bring good luck, so it was a huge tourist draw with everyone getting crazy and snapping images. BUT our guide told usit was only lucky if if you touched the small figure of him being thrown off he bridge. Everywhere people touched was polished, so it was obvious from the picture below many didn't know where to touch the plaque. However, you could see the well-informed tourist here and there that knew the score. As we stepped off into Lesser Town (or Little Quarter), I was struck by something I had seen on the bridge. There were vendors all along, and many featured artwork depicting or lyrics by John Lennon. Then in this new area there was both a John Lennon Cafe and a memorial wall where people left notes and graffiti in tribute. Why? According to Maria, John Lennon never visited Prague, but his music and life inspired many of the youth. His untimely death had a huge effect here on the young people and many secretly began to post notes in tribute on this wall - something illegal at the time. His death became a symbol of freedom that continues to this day. Another interesting note was the flood marks on the wall of the John Lennon Cafe. If you look closely they are marked by date. I would guess this cafe is about 1 meter or so above the river level. Notice it was under almost 3 meters of water in 2002. From here we rode a bus up to the castle/cathedral area. You can walk it, but I would save your energy for walking other areas. Prague Castle is not a castle in the traditional sense. It is very spread out and open. The Cathedral - which we toured after our guide left - was well worth a look if you enjoy architecture and it was fun trying to guess when different parts were built. I would suggest a search online for more in depth history. The picture on the right below I included as it's an interesting detail of the church. It is a mural created from very small tile that was removed and sent out of the country to be restored and then reassembled and put back up. The sheer difficulty of marking where each specific tile went had to be enormous. This is a long post, so I'm going to wrap up the rest of the day quickly. It was now time to head off on our own and using the suggestion given us by Go Real Europe, we managed to walk the winding streets from the castle first to the Strahov Monastery. Loved the walk through winding streets with occasional glimpses of cafes with great views. At the monastery we viewed 2 beautiful library rooms with gorgeous painted ceilings. Oh to have walked in and just sat for awhile, but alas we had to gaze at the interiors from the doorway. In the hallway we were allowed in there were many wonderful pieces of furniture decorated with in-laid wood. From there we continued toward the park where Petrin Tower is located and grabbed a table overlooking the city at a restaurant near the mid-stop of the Funicular. I forgot to write down the name unfortunately, but we shared a couple pints and some meal-size salads. We chose not to go up the Petrin Tower, a decision we later came to regret. So we had to return here another day. Down the funicular, onto a bus and back to our hotel for a snooze. Then we decided that night to again wander around Wenceslas Square and enjoy the camaraderie and music. The strangest thing we saw was a group of Peruvian musicians performing in North American First Nation's costumes. On the way back to our hotel, we picked up a few of those interesting open faced sandwiches recommended by our guide earlier and headed back to the hotel to relax and look at the suggestions for day 3. The sandwich selection was very limited as after 8 at night, they are half price - but we found several that hit the spot.